After the action-heavy drive of the previous instalments, The Hunger Games: Mockingjay – Part 1 is decidedly sober and contemplative in comparison, but no less thrilling. Bunkered down in District 13 after being saved from the Quarter Quell, Katniss (Jennifer Lawrence) reluctantly concedes to become the face of the rebel uprising. Her reluctance quickly turns to intensity, however, as President Snow (Donald Sutherland) continues his tight dictatorship, using Peeta (Josh Hutcherson) as bait. Laced with a political and satirical edge that details the war of words and images as opposed to that of the physical violence that’s yet to come, Mockingjay – Part 1 is smart and coldly calculating. The script, written by Peter Craig and Danny Strong (who scooped awards for HBO’s Game Change), effectively delves deeper – and considerably darker – into the world, exposing old and new wounds alike. There’s plenty of character study on display, too, which kindles better performances across the board. Lawrence, as ever, is the heart and soul as Katniss, and she’s ably supported by old-timers Elizabeth Banks, Woody Harrelson and Philip Seymour Hoffman, and series newcomer Julianne Moore as District 13 leader Alma Coin. 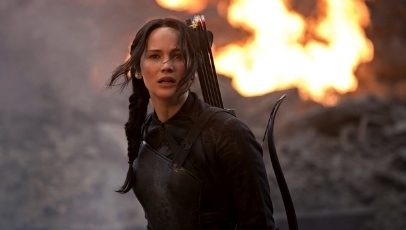 Admittedly, Mockingjay – Part 1 contains less action than franchise stalwarts will be used to. But that’s no bad thing. And what it lacks in brute force, it more than makes up for in cleverness, potent satire and calculated thrills.